Church Training Academy is a website and community for small and medium-sized churches where we learn how to use, master and exploit media and technology to change people’s lives. Hi! I’m Dave Curlee and I created Church Training Academy to help you leverage the wonderful world of digital media so you can maximise your ministry. I understand that all these new technologies and social media sites can be overwhelming, so I’m here to help. I’m sure you’ve noticed that a lot has changed over the last few years. The internet is everywhere. Everywhere we look, someone is ‘heads down’ on their phone. Think about how many of your church members are using the Bible on their phone, instead of a physical book. Things are changing. Churches big and small, all over the world are using digital media inside and outside their walls. They’re using websites, phone apps, video, podcasting, live streaming, ebooks, visual elements in worship and teaching. Things are changing and it’s only getting better. No one knows how to do it. I understand it can all be a bit overwhelming. I’m working through these same things with my church. But it doesn’t have to be overwhelming. I’ve got your back! 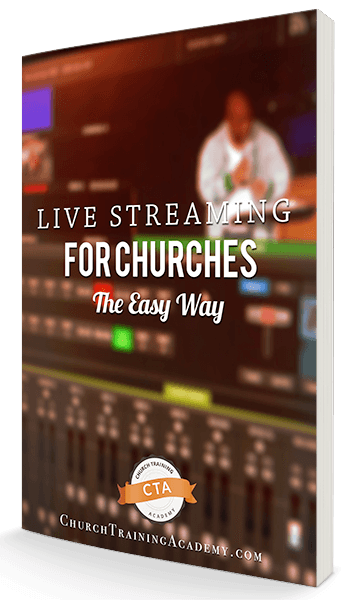 To get you started, I’d like to give you a free guide, Live Streaming for Churches – The Easy Way. I’ve been asked over and over “How can we stream our services and make them look good?” I think you’re going to be surprised just how easy it can be to get started – and it’s not expensive! This FREE guide will help!